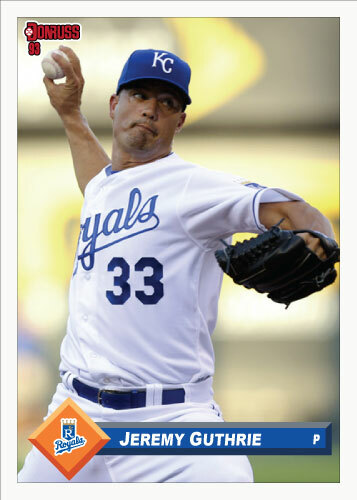 I wanted to post a card of Jeremy Guthrie before his start tomorrow. He pitched awesome last time out but with an ERA still over 6.00 it isn’t likely to happen again tomorrow so I wanted to get the card up still in the wake of his great start. This is kind of a cool thing about my custom card spring training set; this will surely be the only card of Greg Golson ever made on the Royals. He was send down and then traded today to the Chicago White Sox. I think he may have only tallied one spring training hit as a Royal. The Royals roster is starting to take shape. Major moves were made today that will effect the Royals opening day roster. More on that later. 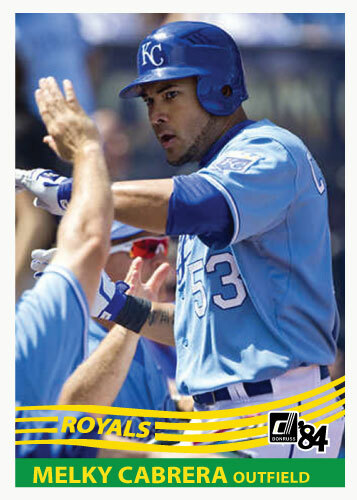 The Melky Cabrera trade was a good deal for the Royals. They had Lorenzo Cain ready and no place to put him and a desperate need for starting pitching. They got their pitcher but I am going to focus on how it will effect the Royals lineup. It is interesting how well this worked out for the Royals. I think Melky Cabrera had a career year last year. I’m not going to say it won’t happen again but I feel it is unlikely. 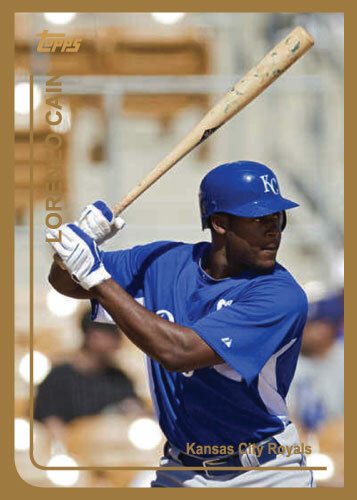 Lorenzo Cain will replace Melky Cabrera but it will effect the lineup. Melky Cabrera batted second basically all of 2011. Cain will not bat second in 2012. He will likely end up near the bottom of the lineup at number 7. This will be a good low pressure spot for him to get established in the major leagues. The move of Cain down will shift Johnny Giavotella up the second hole. This is where the Royals second baseman had batted in the minor leagues and he could be an excellent number two hitter. Cain could shift to the top of the lineup but it is unlikely will all of his strikeouts. If he cuts down on them he could be a candidate to be a leadoff hitter. This would allow Alex Gordon to move to the number two hole where I feel he would be most valuable for the Royals but it is unlikely. So Melky Cabrera is gone. The Royals sent him to the coast for left handed pitchers Jonathan Sanchez (right) and Ryan Verdugo. It looks like a good trade from my perspective. Sure Melky had a monster year last year batting .305 with 18 HR and 87 RBI including 201 base hits, but lets face it, that looks like a career year. He was only under contract for one more season so its not like he was part of the long-term future of the team. He was a candidate to re-sign but with Lorenzo Cain and Wil Myers coming up fast in the Royals organization he was far from expendable. 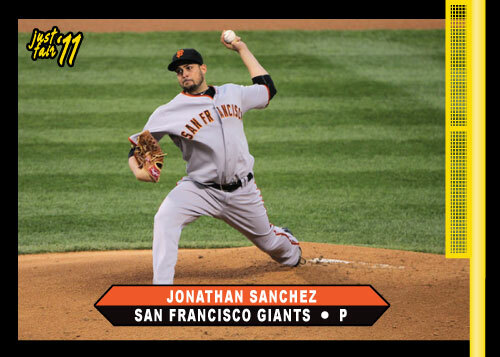 Now Jonathan Sanchez is similar in the fact that he will soon be a free agent. Sanchez is a high strikeout/high walk guy that is sure to eat up a lot of innings. 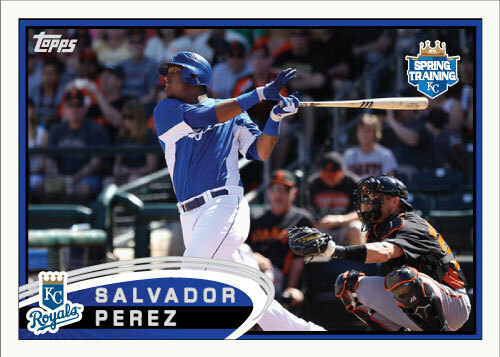 Who knows if he will be a candidate to re-sign or not but the fact is that with the addition of him it shows the Royals are going to try to win in 2012. Will They? Maybe not but at least they aren’t afraid to go for it at this point. They are closer than any season since about 1993 in my opinion to being a contender. Plus they got another left handed arm to add to a deep arsenal in Ryan Verdugo. Sanchez will help the rotation in 2012 under any circumstance unless he gets injured. The most important thing about the trade may be what the Royals gave up. Did they give up a prospect? No. Did they give up a potential building block of the organization? No. They gave up a guy that we basically got for free on the free agent market last off-season. It was one of the best signings of that off-season but the team had little invested in him. This was a great trade for the Kansas City Royals. So Mike Aviles recently commented about not liking his utility infielder role with the Royals. I think that was what stamped his ticket out of town. Aviles was traded to the Boston Red Sox for Yamaico Navarro and a single A pitcher today. A good move for the Royals I feel. Aviles wasn’t happy and really didn’t fit in the scheme for the future for Kansas City. I just predicted this would be the only move the Royals would make before the deadline this morning on Pine Tar Press. I believe the Royals are done trading now.